It’s Called Reading | Does This Font Make Me Look Fat? 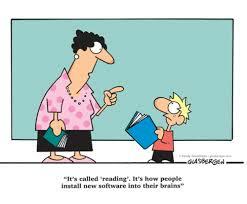 “It’s called ‘reading.’ It’s how people install new software into their brains. This is a Randy Glasbergen cartoon I found online. I never thought of reading in this way, but it’s so true.